By February next year, Sogo Seibu will have 11 fewer stores than three years ago. It was Japan’s largest department store by store numbers in 2005 when it was acquired by Seven & I Holdings. Since then, Seven & I has failed to turn the business around, and some analysts are suggesting this might lead to the closing of all Sogo Seibu stores outside the Kanto region. A little note from one CEO to another offering sympathy in tough times has ended up becoming what some local observers are calling the biggest new development in omnichannel for years. Seven & I and Askul announced a deal in early July that will see joint online sale and distribution of fresh foods beginning, if all goes to plan, in November this year. Seven & I provides the foods, Askul, through its Lohaco subsidiary, the fulfilment, with both using the full weight of Yahoo and Seven & I for promotions. Mulberry is one of a small number of British luxury brands with a global presence, but has never succeeded in Japan despite a series of partnerships over 20 years. It has now been signed by Onward, which again promises investment in retail stores to raise the brand’s profile among Japanese. Magaseek is a small fashion e-commerce operator, but has found growth by becoming e-commerce partner for retailers, as well as running mobile shops for parent NTT Docomo. Stripe International was the fastest growing fashion retailer for a decade, back when it was called Cross Company. In the last few years, growth rates have fallen away, and efforts to find new growth concepts to add to its core chains have largely failed. Until now. Honeys has never fulfilled its early promise as a trading company-backed, cheap fashions retailer in the late 2000s. Finding the Japanese market too hard, instead it switched its focus to China, but tough competition there means it is now retreating home. Don Quijote and Familymart-Uny revealed talks on a potential business tie-up back in June. 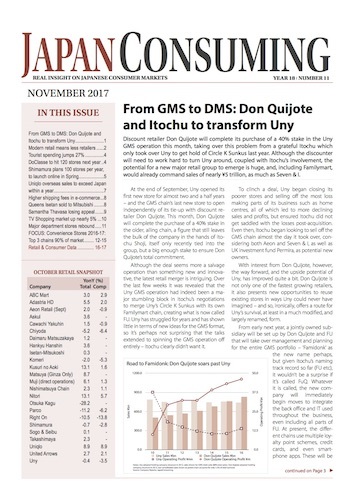 The deal is now confirmed, with Don Quijote investing directly in FU’s GMS chain, a neat solution for both parties, allowing Don Quijote to expand and Itochu to partially solve the Uny problem. Nitori already has more than 400 stores but most of these are suburban or roadside locations. It now plans to open 100 of its more upscale and smaller Deco Home stores in the next three years, and longer term reach parity with Nitori, some 500 stores each. At the same time, it is pulling in other retailers to help its expansion, including department stores, and as of last month, Yamada Denki. IKEA is worried, at last considering opening smaller stores for Japan, and is embarking on a programme of major price cuts. Tokyo Base has been one of the three fastest growing fashion retailers in the last few years, a significant achievement for a select shop retailer. More recently it has taken this knowledge of what sells to develop its own SPA chains, which could see the TSE listed firm emerge as a top 50 fashion retailer in the next five years. Shopping through e-commerce grew 24% in the first six months of 2017, with the average household now spending ¥10,000 a month online. The proportion of households using the net for purchases grew to more than 30%, and the fastest growing category was food. The number of products and services available online also continues to grow. Jupiter Shop Channel leads the TV shopping sector in sales but had seen sales flatten off in recent years. In FY2016 sales took off again, rising 11.1% thanks to new types of customer, and the merchandise to attract them. Fashion goods manufacturers rely heavily on the department store channel, but are being squeezed by both contracting space and consumers who prefer either cheap, or very expensive, imports.